How to Downscale 4K Videos? Get Help from 4K Downscaling Software! 4K resolution gets sharp development and becomes the new trend in electronics and media industry. 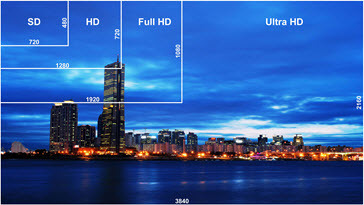 4K is initially taken as a digital camera standard referring to a resolution of 4096 x 2160 pixels. In a few short years, 4K expands its adoption to TVs, PC displays and videos on streaming sites, like YouTube, Netflix. 4K movies are no longer hard to access. 4K wins its popularity in this digital era and brings a superior viewing experience. Requirements of downscaling 4K are still happen and 4K downscaler is quite in need. WinX HD Video Converter Deluxe arrives as a superior 4K downscaler. ▶ Downscale and compress 4K videos to 2K, 1080P, 720P with high quality for better playback on fit mointors. ▶ Fast convert 4K HEVC videos to H.264, MPEG4, AVI, WMV, MOV, FLV, 3GP etc, accepted by more devices, video players/editors and online sites. Part 1: Why to Downscale 4K? Part 2: What Is the Best 4K Downscaler? Part 3: How to Use the Best 4K Downscaler? Why Do You Need to Downscale 4K? Reason 1. 4K video has a large size. iPhone 6s is the first iPhone model available to shoot 4K video with an video recording option of 4K at 30 fps. 4K video on iPhone 6s is much larger than 1080P, about 350MB/min vs. 130MB/min. Although Apple released iOS 11 to support HEVC for halving video file size, 4K video still occupies considerable space on iPhone. What's more, lots of 4K video recording devices still use H.264 codec, such as Nikon/Canon/Sony 4K cameras, GoPro and so on. The video size can reach to 712MB/min with a resolution of 4K DCI (4096 × 2160) at 24fps shot by a 4K camera, while the size of a 1080p H.264 video at 24fps is only 360MB/min. To downscale 4K to 1080P is a good choice to save disk space. Reason 2. Older/Legacy devices can't handle 4K video well. To play 4K videos on computer, the processor and graphics chip should support 4K, for example 4th generation Intel Core process or family, AMD A10-7800 APU, Nividia GeForce, AMD Radeon HD 7000 Series or better. If your 4K videos are encoded with HEVC, you should have a device or computer running on a system fully supporting HEVC, Windows 10, macOS High Sierra, iOS 11, Android 5.0+, for smooth playback. Although there is a supported operation system, computer without a new processor (Intel Kaby Lake or newer, A10 processor or newer) still encounter minor issues to play HEVC 4K files. Downscaling 4K videos to 2K or 1080P can not only reduce file size but make videos flawlessly play on old computer/device which is not qualified to support 4K and HEVC. What Is the Best 4K Downscaler? A preferred 4K downscaler should be capable of inputting 4K videos in various formats (HEVC, H.264, VP9 etc.) and outputting a video in a lower resolution like 2K, 1080P full HD, 720P. In addition, speed of downscaling and quality of resulting file will be another keys to evaluate if one 4K downscaler is worth of installing. WinX HD Video Converter Deluxe is the right 4K downscaler you should have. Developed as a professional video converter and a video scaler, it can make all video conversion a reality, not only for SD to SD, HD to HD, HD to SD, but 4K to HD, 4K to SD and so on. 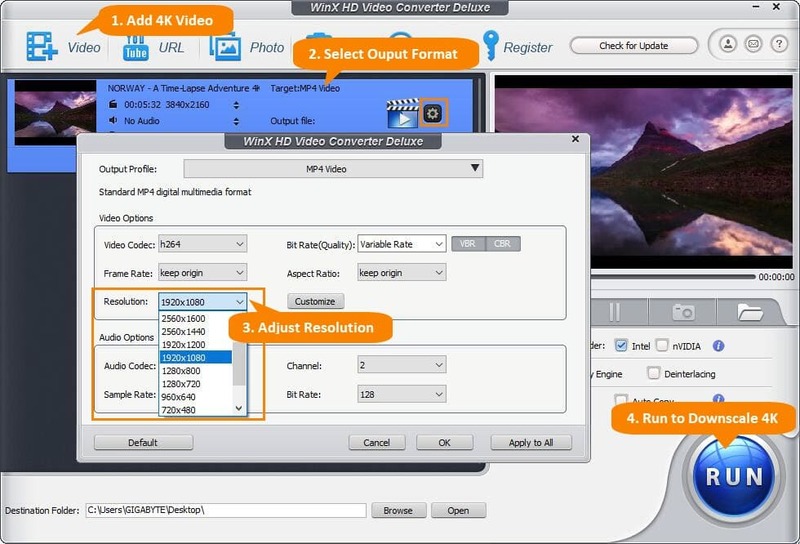 Now, let's learn why WinX HD Video Converter Deluxe can stand out as the best 4K downscaler. Not only can it allow you to add a 4K video as input, it has preset various profiles helping you directly compress 4K to 2K MP4, convert 4K to iPhone/iPad/Android, and transcode a 4K video encoded with HEVC to H.264, AVI, WMV, MOV, FLV etc, accepted by specific devices, player or online sites. It offers adjustable video/audio parameters leading you to manually change the resolution from 4K to 1080P/720P/480P as well as set new value for bit rate, frame rate, aspect ratio to obtain a demand effect of output file. It also works as a video editor to crop unwanted parts on image, trim segment(s) off video, merge several video clips into one, rotate/flip video, fix shaky images, correct fisheye, reduce audio noise, add effects/watermark/subtitles and more. It is very easy to use with a user-friendly and straightforward UI. It is also a 100% safe program without malicious extras hidden in installation package or ads adhered to interface. WinX HD Video Converter Deluxe employs hardware acceleration to invoke Intel QSV, NVIDIA NVENC, AMD VCE to greatly speed up 4K video encoding, decoding and processing. It brings the most efficient performance to downscale 4K to 2K, 1080P, 720P in a highly compatible format like H.264, while maintaining almost lossless quality. How Can You Compress 4K Videos with the Best 4K Downscaler? At the start, you should download and install WinX HD Video Converter Deluxe on your computer. It is fully compatible with Windows 10 and lower version. The Mac version is available for macOS Mojave and lower. After this 4K downscaler is well installed on your computer, please follow the steps to downscale 4K video. Launch WinX HD Video Converter Deluxe and click Video button to access to video processing window. Click +Video button to import single 4K video or multiple 4K videos which you want to downscale to 2K or HD. If you have saved source video files in a folder, click +Video Folder to load all. After the video is loaded. 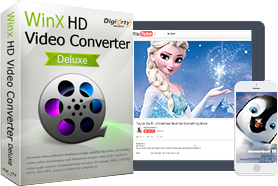 Move to the bottom of WinX HD Video Converter Deluxe window and click Video tab. The most commonly used formats appear, including MP4 H264, MP4 HEVC, AVI etc. Move left/right arrow to select desired format as output format. If there is no wanted format listed, click + button to get more profiles. Click Codec Option. The format settings window pops up. Move to Video Codec Options panel and find Resolution. Select 2560X1440 (2K), 1920X1080 or other resolutions depending on your needs. Then, click Apply to All for all videos or Done for single video. Redefine a new folder to save the resulting file by clicking Browse if necessary. At last, click RUN button to start using this 4K downscaler to compress 4K video to 2K, 1080P and more. Hardware acceleration is auto-enabled on the basis of your graphic cards so that you can get 4K videos downscaled at a very fast speed. • Download 4K videos from YouTube, Vimeo, Dailymotion, Facebook, Twitter, Instagram and other 300+ sites in a flash. • FAST convert and compress online/local 4K (HEVC) videos to 2K MP4, H.264, AVI, WMV, MOV, FLV, 3GP, iPhone, iPad, Android, Windows Mobile, Xbox, Sony PlayStation, smart TVs etc, with high quality. • Use level-3 hardware acceleration (Intel/NVIDIA/AMD according to your graphic cards) to bring the fastest performance to encode/decode/process 4K videos and maintain almost lossless quality.